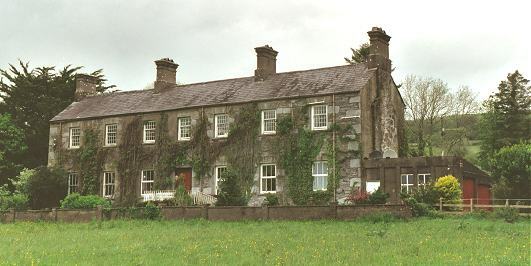 Co. Kerry: Ballybog (2), Bowrdoneen (2), Bunawn (2), Kenmare (3), Kilgarvan (2), Tuosist (2), Templenoe (2). The Board also included 5 ex-officio Guardians, making a total of 20. The Guardians met on alternate Saturdays. The population falling within the Union at the 1831 census had been 29,152 with divisions ranging in size from Bunawn (population 2,023) to Tuosist (6,208), Bowrdoneen (4,986) and Kenmare itself (4,963). The new Kenmare Union workhouse was erected on a nine-acre site half a mile to the north of Kenmare. Designed by the Poor Law Commissioners' architect George Wilkinson, the building was based on one of his standard plans to accommodate 500 inmates. Its construction cost £6,550 plus £1,380 for fittings etc. The building and operation of a workhouse had to be financed by the ratepayers of each union and in many places was seen as an intolerable imposition from England and its officials. It took until 15th June 1844 to raise the first poor rate in Kenmare, with the workhouse being declared fit for the reception of paupers on 19th August, and not receiving its first admissions until 25th October 1845. The site location and layout of the Kenmare workhouse are shown on the 1902 map below. During the famine in the mid-1840s a fever hospital to accommodate 40 patients was erected at the east of the workhouse. The former workhouse site is now occupied by Kenmare Community Hospital which replaced the old workhouse buildings in 1936. What appears to be the original fever hospital building survives as private residence. Kerry County Library, Moyderwell, Tralee, Co. Kerry. Holdings include Board of Guardians' minutes (1840-1921).